Mccoy Teas: How Much Herbal Tea Can I Drink A Day? How Much Herbal Tea Can I Drink A Day? Sometimes known as ‘tisanes’ in Europe and other parts of the world, herbal teas contain a blend or mixture of dried herbs, leaves, bark, fruits, or flowers taken from any edible non-tea plant, and often contains no caffeine. A tea is considered a “true” only if it contains tea plant leaves. The leaves of oolong, white, black, and green tea come from the tea plant Camellia sinensis and are considered to be “true teas”. In contrast, herbal teas do not come from the Camellia sinensis plant because they do not contain actual tea leaves. Some examples of herbal tea include: hibiscus tea, peppermint tea, chamomile tea, spearmint tea, turmeric tea and ginger tea. Herbal teas can be created using nearly any mix of natural ingredients. Each herbal tea, then, comes with its own flavor and health benefits. The quantity of herbal tea that can be consumed in a day depends on the type of herbal tea. Certain herbs used, for instance, should be taken in small doses, such as licorice, as they can react differently in the body. Similarly, how much herbal tea can be drunk in a day depends on the method of brewing and the quantity used in the brew. A small tea bag has less herbs (often lower quality) than a large spoon of high-quality loose leaf tea. In addition, the period of time in which the herbal tea is kept in the water matters: a five-minute brew extracts less than a long brew in a simmering pot. While the caffeine-free nature of herbal tea makes it safe to drink as much as 08 cups a day without worrying about caffeine-induced side effects, it is best to research the types of herbs and plants used in the herbal tea mixture, their side effects and whether it is suitable depending on your history of health. 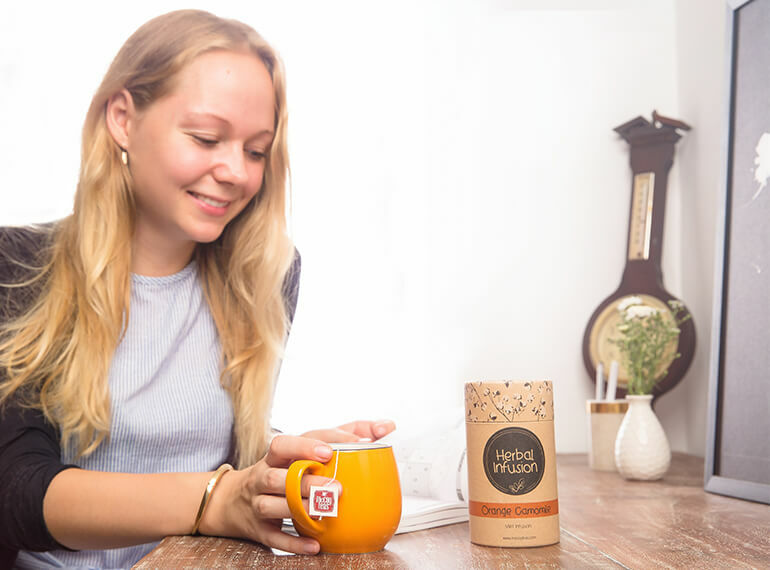 Though herbal teas have been around for a long time, they have become popular over the last few decades owing to their flavours, and mental, physical and emotional health benefits. For example, chamomile tea is a popular remedy for relieving anxiety, stomach problems and other mild infections, while remedying sleeping troubles. Peppermint tea induces calmness, while ginger tea is used to soothe headaches, nausea and alleviate flu symptoms. Dandelion tea, made from the leaves, flowers, roots or a mix of the plant, is not only delicious but eases constipation and stimulates digestion, and helps to ease pain and arthritic swelling. Lemongrass tea can reduce fever and acts as a pain reliever for muscles and joints, while boosting the mood. In general, herbal teas can relieve various ailments and problems. It is usually consumed hot, but herbal teas can even be chilled or served with ice. At the end of the day, you can safely drink as much as you want but if your body reacts unfavourably, then stop. As with anything, good things should always be taken in moderation.